This version came from an article in The Guardian. Of course I tweaked it a bit. For instance, the original calls for 75 grams (3/4 cup) of orange peel fried in oil and used to decorate the rice. Maybe I don’t have the right kinds of friends, but every time I have added large amounts of orange or lemon peel to anything, afterwards I would find discreet little mounds of peel pushed to the sides of their plates. Also, the original recipe says, “Serves 4 as a starter.” Four? Four what? Wolverines? As a starter? This makes a LOT. 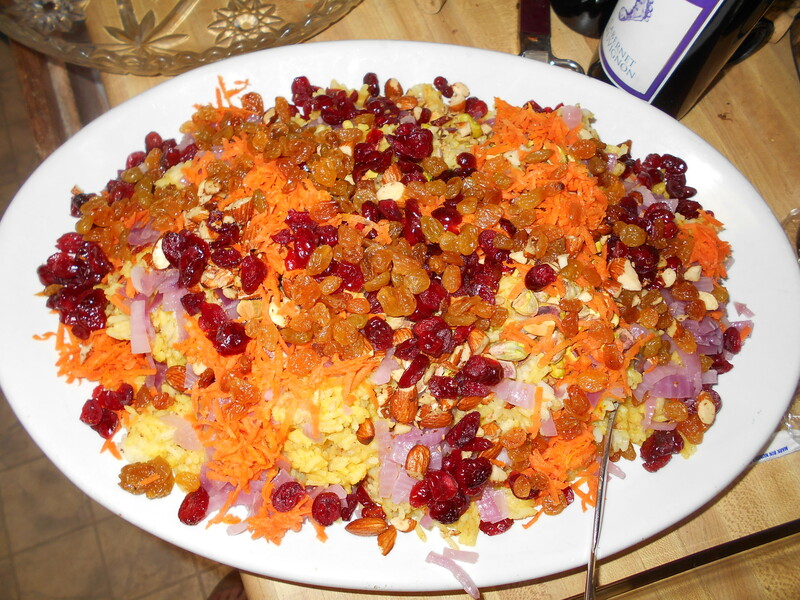 I piled this onto the biggest platter I own – one I reserve for 25-pound turkeys – and it was barely large enough. There were ten people at dinner and there was still at least four or five cups left over. I won’t deny that there are a lot of fiddly steps, but they are done in advance and are not difficult. I suggest putting each of the toppings in its own little bowl and covering it with clear plastic wrap so that final assembly goes smoothly. I’ll also admit that my conversion of metric-American measurements are pretty loose. Chop the pistachios, put in a bowl and cover. Chop the almonds, fry in a small amount of oil until they smell toasty, then put in a bowl and cover. Fry the cranberries and the raisins separately in a small amount of butter until they plump up a bit, then put each in their own bowl and cover. Fry the onion in a little oil until it just softens, then put in a bowl and cover. Fry the shredded carrot in a little oil for about 1 minute, then put in a bowl and cover. Bring 6 cups (1200 grams or two parts water to one part rice) water to a boil and add the rice. Stir rice, then cover and reduce to lowest heat. After ten minutes, turn heat off. After 15 more minutes, stir in the saffron water and the rice spice. Rice will stay hot, covered, at least 30 minutes after it is cooked. When ready to serve, spoon rice onto very large platter. Now take the toppings and decorate the rice in attractive patterns. To vary it, there are plenty of dried fruits that could be substituted – I think cherries, apricots and mangoes would be especially good. Lightly toasted sesame seeds would be nice as well. I don’t see why other grains such as barley or quinoa wouldn’t work in this. About the saffron: yes, it’s expensive, but a little goes a very long way. Find it on Amazon for a lot less than in the supermarket (I bought mine from Ganesha Spice). A hint about using it: when you open it, place the container over a white paper towel to avoid losing any. Tweezers might be a good idea here, as it is a little tangled mass of dried stamens and they can suddenly pop apart and scatter without warning (I now know this). About the rose petals: I stepped outside and picked a few dried ones from a rose bush. Next time I would change the proportions of the rice spice, decreasing the cinnamon to 1 teaspoon and increasing the cardamon, rose petals, and nutmeg to 1 teaspoon each. This is wildly festive and an important dish in its own right, not just a side bowl of rice. This went with Iraqi spice-rubbed chicken but would be excellent with any simply grilled meat, or as part of a vegetarian feast. Posted in recipe and tagged dried fruit, Middle Eastern, rice, vegan, vegetarian. Bookmark the permalink.